It’s not only IFA 2014 in Berlin where Samsung’s going to take the center stage, there’s another event before the team at Samsung heads over to Berlin. 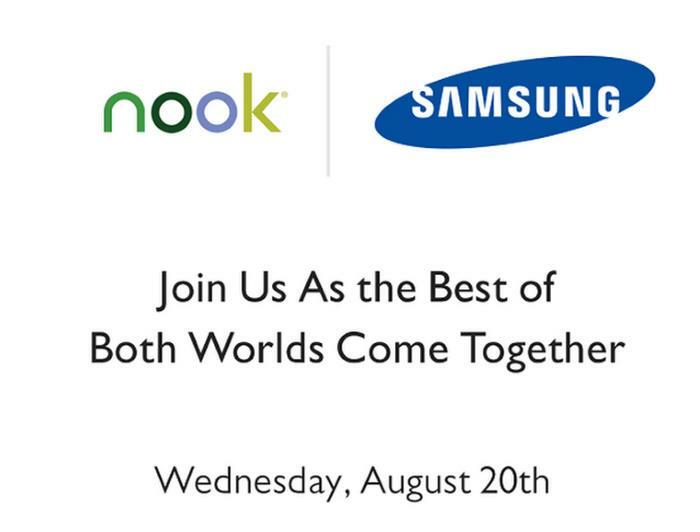 Samsung has scheduled an event on August 20th in New York where they’ll share the stage with Barnes & Nobles to announce the first Galaxy Tab 4 Nook. There’s no word about what we’ll see at the event, the invite says, “Join us as the best of both worlds come together.” A few months back, it was revealed that Samsung is working with Barnes & Nobles to launch a new tablet which will come with hardware provided by the Korean OEM. The tablet will run a software by Barnes & Nobles, and is going to be their first co-branded tablet. Samsung Galaxy Tab 4 Nook will come with a 7-inch display sporting a resolution of 1280 x 800 pixels, and will give users access to Barnes & Nobles library of three million books, magazines and more, and it will be sold at Barnes & Noble stores in the US. Samsung has already confirmed that Galaxy Tab 4 Nook will be showcased at the event, but didn’t provide any further details of what we can expect from the tablet. We’ll update you as soon as the tablet is officially announced.